Are You Using Chip Cards Yet? As a result of this liability shift, brick-and-mortar stores are expected to upgrade their card readers and processing systems to accept chip cards, also known as Europay, MasterCard and Visa (EMV) cards. If a store fails to upgrade and accepts an in-store payment with a chip card using a magnetic-only card reader, the store — not the card issuer — is generally responsible for replacing any fraud losses. CardHub, a credit card comparison website, recently followed up on the status of EMV compliance in the United States with its "2016 EMV Adoption Survey." It revealed that 42% of U.S. retailers still haven't upgraded the terminals in any of their stores. What's more, the adoption rate is no better for merchants who've been hacked in the past. The study found that, among U.S. retailers who've experienced a data breach in the last five years, 43% haven't upgraded their card readers. Although upgrading may be costly, especially for small banks and retailers, EMV technology provides greater protection for card issuers, merchants and consumers. By using a card without a chip or shopping at stores that aren't EMV-compliant, you're putting your accounts at greater risk of fraud. Here's why. How do chip cards help fight payment card fraud? A chip card contains a tiny metallic square that's actually a minicomputer. Chip cards generate a unique encrypted code for each transaction, so they're more secure than magnetic cards when read by an EMV-compliant processing device. For now, most U.S. chip cards call for dual authorization with card holder signatures, unless the card previously required a personal identification number (PIN). Eventually, the United States may transition to chip-and-PIN cards, which would add a layer of fraud protection. Conversely, magnetic cards store static information, similar to old-fashioned music cassette tapes, making them easy targets for hackers. If a thief steals data from a magnetic credit card, he or she can copy the unchanging data onto a cloned card and use it to make purchases or withdraw cash. Card issuers in Canada and several European, Asian and Latin American countries have already seen payment card fraud rates drop significantly after they switched from magnetic cards to chip cards. In addition, most foreign chip card readers already require PINs. In the past, card issuers — including banks, credit unions and other financial institutions that issue debit or credit cards — generally accepted all liability for counterfeit payment card transactions. But on October 1, 2015, the liability for counterfeit in-store payment card transactions generally shifted to the party (either the issuer or merchant) that doesn't support EMV. The liability shift doesn't change the responsibility for online purchases, in-store transactions conducted using lost or stolen cards, or in-store transactions conducted using cards that only offer magnetic strips. Payment card issuers will continue to be liable for payment fraud that occurs with these types of transactions. 56% of consumers don't care if a merchant's equipment is chip-enabled. 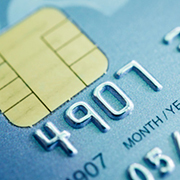 It's easy to tell if you're using EMV technology. Chip cards have a tiny metallic square on the front. Most chip cards will also have a magnetic strip on the back, at least for now. These may be used if the merchant's card reader isn't chip-enabled or the chip reader (or card) malfunctions. You know a store has installed chip-enabled terminals if the checkout clerk asks you to "dip" your card into the bottom of the reader, rather than "swipe" the magnetic strip. You also might notice that chip card payments take about 10 seconds longer to process than magnetic strip card payments. This gives the chip card's minicomputer time to communicate with the merchant's terminal. Although consumers aren't directly affected by this shift of liability, they'll benefit from more secure credit and debit cards. Criminals steal billions of dollars through payment card frauds each year. When fraud strikes, it's a huge inconvenience to card holders. Victims might, for example, need to dispute fraudulent charges on their monthly card statements, cancel their existing cards and wait for new cards to arrive. They should also switch all automated bill payments and online shopping accounts to the new card numbers and expiration dates. Fortunately, chip card technology can help reduce your chances of becoming the next payment card fraud victim. But you only get the added layer of protection if you use chip cards and shop at stores that have updated their equipment and processing systems. Contact your financial or legal advisers for more information.